In my office we’re lucky enough to be able to sneak in a quick game of some sort just about every day around lunchtime. 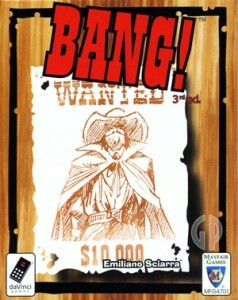 Recently, my coworkers and I have been slinging bullets at each other in the wild west card game Bang! For those unfamiliar with this charming and addictive card game, you should read more about it, and I would highly recommend picking up a copy. Unfortunately, until you play a couple of times, the rest of this article isn’t going to make much sense. One of the great things about Bang! is that once players are comfortable with the rules, the game is flexible enough to allow for quick and easy house rules without disrupting the balance or fun of the game. Many Bang! players have introduced house rules over the years, and some of the expansions to the game introduce new play mechanics. These are the house rules that we’ve tested out in the office and made a mainstay during our lunchtime pickup games. Taking the horse theme one step further, we decided that a real gunslinger (or a cowardly one) might take cover behind just about anything. Now, when a player’s horse is shot, the player can turn the horse card sideways and it acts exactly like a Barrel card. If that player already has a Barrel in play, the Mustang card is simply discarded. The dead Mustang can be the target of a Panic card and stolen, just like any other card in play. 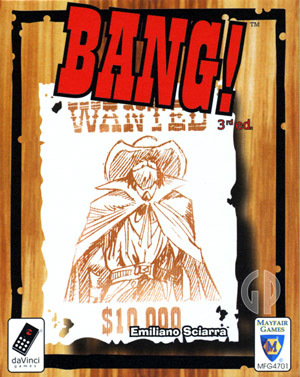 If taken with a Panic card, it remains a dead Mustang in the opponent’s control and that player can now use it for cover. Dynamite – now with more deadlier dying. It seems that people in our office just can’t get enough of the Dynamite card; whenever it comes into someone’s hands there is inevitably a mad chuckle and it’s thrown down with wild abandon. Somebody getting their face blown off every game (usually me) has become such a common occurrence that many felt the rush was gone. So we decided to enhance the carnage. Now, when Dynamite explodes, it does three damage to the player holding the card but it also does one damage to the players sitting to the left and right of the explodee, as well. That seems to have brought the rush back. For now. Typically, we get about six players to a game (it’s also how many we can fit around our game table). In the regular rules, the mix is one sheriff, one deputy, one renegade and three outlaws. We felt that was a bit unbalanced compared to the five- and seven-player versions, so we decided to mix it up a bit. Now, before the role cards are dealt to the players, one deputy and one outlaw are taken out of the deck of seven roles, shuffled and one is secretly picked to distribute with the other five roles. In this way, no one knows if there are two deputies or three outlaws in play. This opens up a whole new world of bluffing, as even if a deputy is eliminated early in the game, the outlaws and renegade can continue to swear to the sheriff that they are on his side.